A few weeks back I took a first look at Microsoft’s new iOS offering, Office Mobile for Office 365, aka Office Mobile for iPhone. My initial conclusion remains the same now as it was then: Office for iPhone may be a nice addition to your existing Office workflow, but the app strikes me as unnecessary, not particularly good, and—considering that it requires a $100-plus subscription to Office 365—rather expensive for an app that offers little in the way of tangible value. 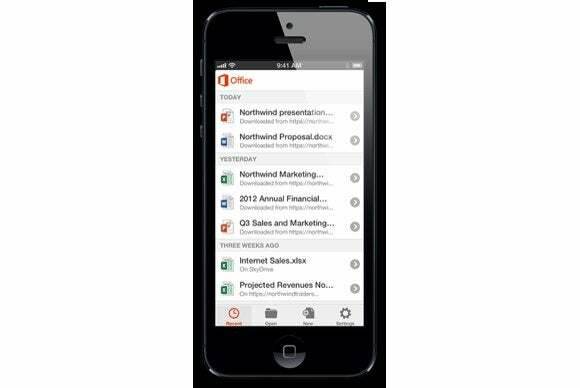 Office Mobile for iPhone is an iPhone-only app that offers access to the three major features of Microsoft Office: Word, Excel, and PowerPoint. Office for iPhone’s Word and Excel apps allow you to create and edit their related documents, PowerPoint exists mostly as a tool for viewing existing PowerPoint documents. Which is to say, you can use the PowerPoint app to make minor text changes to your presentations and in a pinch, you can use it as a presentation tool. While Office for iPhone may provide a modicum of value for some users, the reality is that most Microsoft Office users will see no benefit from this app. Using the app requires access to Microsoft’s SkyDrive, a Dropbox-like service that synchronizes files on all your devices. SkyDrive is one piece of Microsoft’s Office 365 service and costs from $100 to $120 annually, depending on whether you want to pay once annually or month-to-month. Office 365 comes with a desktop copy of the lastest version of Office and offers access to online versions of Microsoft’s Office Suite. It’s a great deal if you’re interested in all the Office Suite has to offer, but it may be more than you bargained for if you only want to use Office Mobile to edit or view files you already have or that are being emailed to you by others. When text is selected in any Office document, Office Mobile offers no options for cutting the selected text. You can only copy, paste, or comment. As a word processing tool, Word in Office Mobile is, at best, an uneven experience and at worst, an exercise in frustration. Word does not behave like any iOS app you’ve ever used to edit text. Documents in Word have two modes: A preview mode where you select and copy text and create comments in your documents. There’s also an editing mode where you can make changes to your document. Selecting text differs depending on which mode you’re in and neither mode uses iOS’s normal text selection tool. In preview mode, tapping and holding a word selects it, after which you can use the selection tool to select more text. In editing mode double tapping a word selects it, and once text is selected you can change fonts, colors, and paragraph formatting. It’s unclear why Microsoft decided to diverge from normal iOS editing methods, but the difference was significant enough that I could not discover how to select text for editing just by using the app. Once I did figure it out, I was able to make changes to the text without a problem. Although I did notice that it was very difficult to grab text selection handles that were near the left edge of the screen. Of the three Office apps, Excel is the best—which isn’t to say that it’s great, but that it’s the least frustrating of the bunch. It should be noted that there isn’t a spreadsheet app on the planet I’d like to use on an iPhone. Even Apple’s Numbers, while amazingly useful, leaves a lot to be desired on the iPhone’s small screen. But that aside, Excel works well on the iPhone. The app offers just over 100 built-in functions, which is significantly less than what the desktop versions of Office offer, but what is available should be enough to suit most user’s needs. Cell and text selection in Excel worked well, however, I wish the app did a better job of detecting the type of data being edited in each cell. A Numbers-like keypad that knows when you’re editing text and when you’re editing numbers would go a long way toward saving taps when trying to enter data. PowerPoint offers the least features of all three apps. PowerPoint is essentially a viewing tool with some minor editing capabilities. You can make changes to text, but really nothing else. I did plug my phone into my television to see how well it worked as a presentation tool and was pleased by how well it worked. Rather than automatically saving your documents, Office introduces your iPhone to an old friend, the Save window. Office for iPhone has many pain points, so I’ll just list a few more. When making formatting changes, particularly when making adjustments at the point where your cursor appears in a document, there were occasions when the app lost its ability to provide a visual indication that a change had been made. So, tap the Bold button and it still looks like you didn’t tap it. I found that closing the app from the multi-tasking bar and reopening it resolved this issue. Also, there is no option for cutting text you’ve selected, you can only copy and paste text. Unlike normal iOS apps, all the apps in the Office Mobile suite require that you save your documents. If you create a new document or make changes to an existing document then close it, you will be prompted to save your changes. Likewise, if the app crashes while you’re in the midst of editing your document, any of your changes will be lost. Finally, if you’re still using Microsoft’s .xls format for your files, none of those files can be edited or even viewed using Office for iPhone. In fact, if you have .xls files saved in your SkyDrive, Office for iPhone’s file browser won’t even display those files. While Office for iPhone may provide a modicum of value for some users, the reality is that most Microsoft Office users will see no benefit from this app. The app’s Office 365 requirement, poor user interface, and odd editing tools combine to make Office for iPhone something you should only use if you have to. The many quirks and missing features in Microsoft's Office Mobile for iPhone make it a difficult app to recommend.